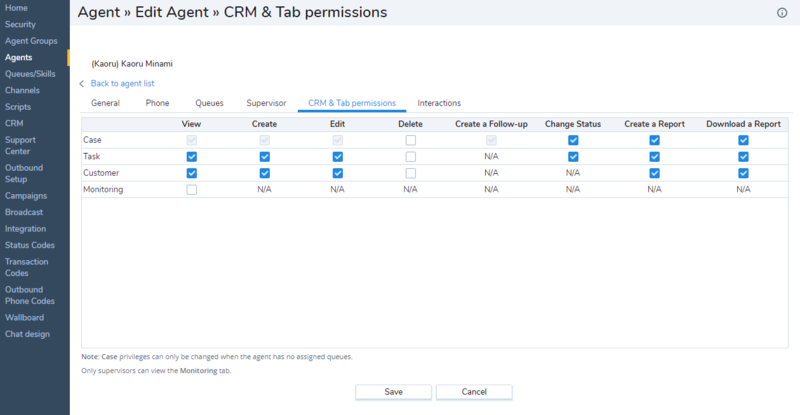 Administrators can grant Local CRM permissions to agents and supervisors to manage customer data, such as cases, customers, and tasks accessible via Agent Console. Administrators can grant the permissions to view, create, edit, or delete customer data via Users > CRM. Find an agent and click or . Grant the desired permissions to the agent. Download a report: Agents can continue to run the report even if the ability to download a report is disabled. If you disable any of the above controls, the agent cannot see the corresponding feature in Agent Console. Note: To revoke or edit the case permissions, you have to unsubscribe the agent from all queues to avoid any conflict. Only supervisors can view a Monitoring tab. Note: An agent is able to clone tasks in Agent Console if the administrator grants the permission to create and edit tasks to that agent. Customer Select or change permissions to view, modify, and delete customers data. Monitoring Select the permission to view monitoring.